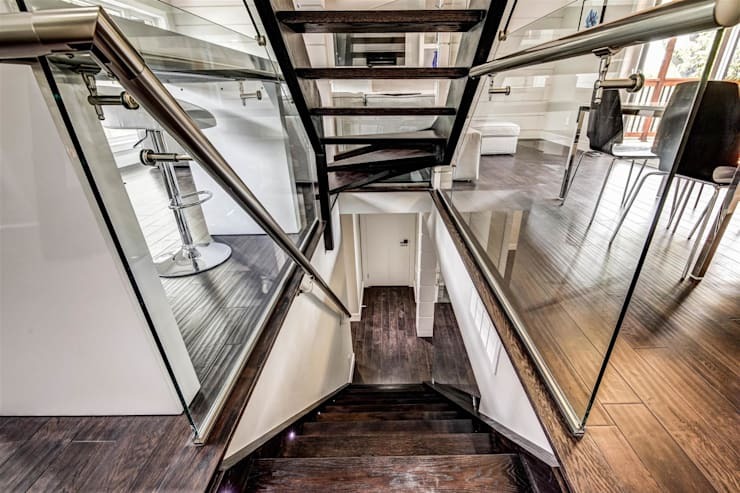 They say, you can not judge a book by its cover, and it holds true in case of this great looking Modern Toronto house that sports a basement too. A house in a big and busy city is generally expected to be cramped, small with limited space for all necessary activities and areas. 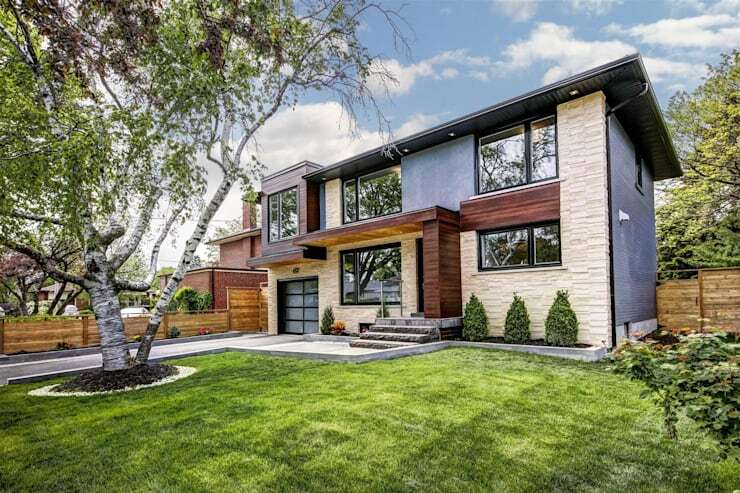 Designed meticulously by the designers at Contempo Studio, this house looks great on the outside, and is completely amazing and very comfortable on the inside. The house is an absolute head turner and luxurious on the inside as well. 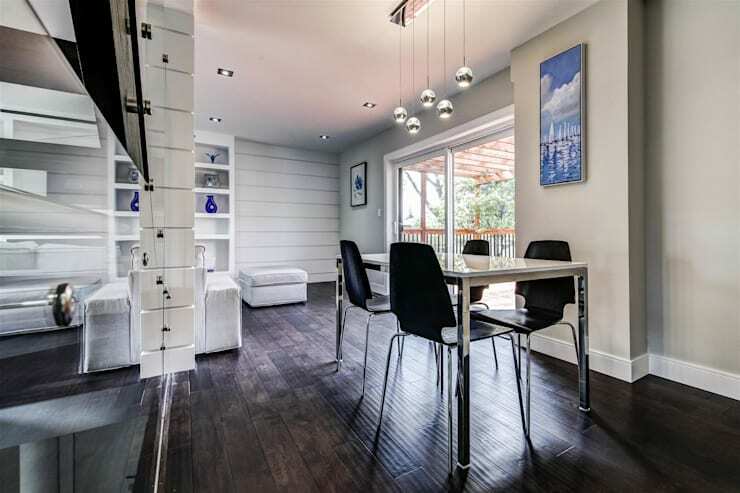 Let us take you to a tour of this modern, spacious and comfortable home in Toronto through this ideabook today. Ready? Impressive is the first word that would probably come in mind when you lay your eyes on this house from the outside. The exteriors of the house are designed in wood, stone and glass. The lush green lawn in the front is a perfect complement to the natural exteriors of the house, a a great place for absorbing the precious sunlight during the warm summer months. The car garage has a sliding door, and a bold black concrete path leading up to it, adding a great contrast to the woods and the greens. The entrance leads to this spacious living room adorned in neutral colors. 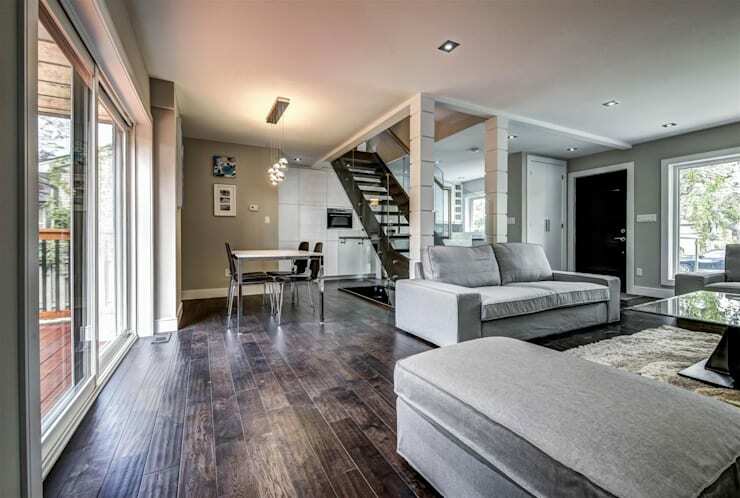 The living room has straight stairs leading to the basement as well as the first floor. The columns that support the top floor add texture to the hall. The couches are made from light neutral fabric, making them cozy to sit and even sleep on. The large glass windows almost replace the wall, and make the room look fresh and lively with the natural light. The kitchen is on the opposite side of the living. The wooden tiled flooring continues the use of wooden element from the exteriors. The wall that hosts the TV, also hosts the fireplace and space for other decorative elements. The fluffy rug in neutral color adds a lot of texture to the room, and the glass center table almost blends with the room surroundings. Here are 30 inspiring ideas for your living room. The dining area in the middle of the kitchen and living room adorns a dining table that is simple, small and practical. The small suspended lights on top of the dining table, add brightness and focus, however the lights do not disturb the peaceful ambiance of the house. The straight wooden stairs lead to the basement, which again has an all wooden floor. Having a basement is such an advantage. In addition to being good storage, a basement allows you space for your workouts and parties too. The bathroom has a twin basin concept, and has marble walls and floor, giving it an elegant and royal appearance. 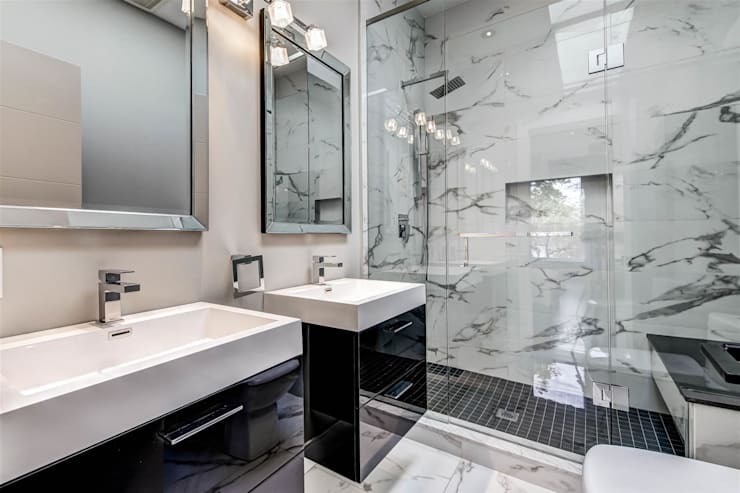 The colors are minimal, and a produce a beautiful monotone bathroom, that is well lit using artificial lighting, since the bathroom does not have a lot of natural light in it. A great bathroom can just be created by using the space efficiently, see some unique bathrooms that create more space. 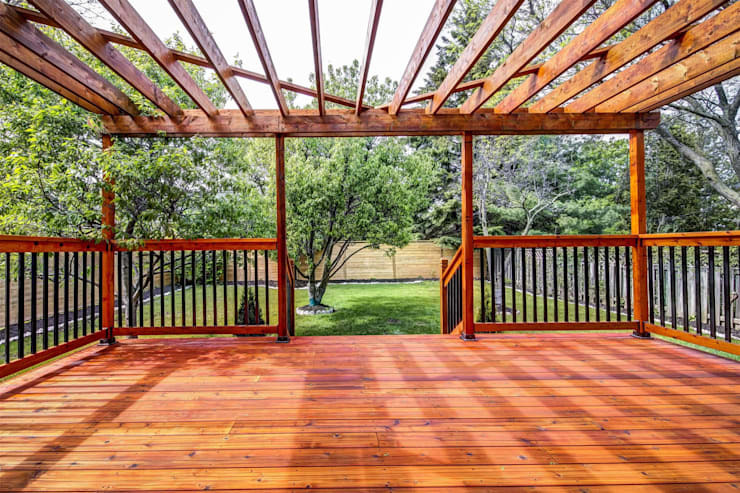 A lovely wooden sun deck, is just what you need to have a blissful summer right in the comfort of your home. The sun deck in this house has a wooden pergola on the top, which can obviously be covered when you need shade or protection from rain. The wooden floor is in natural wood color and is a treat to the eyes overlooking a green backyard garden. Looks like the designers discovered the formula for making every afternoon and evening great with this warm looking, natural wooden deck. See here for a few other great looking porches for people who love outdoor living. 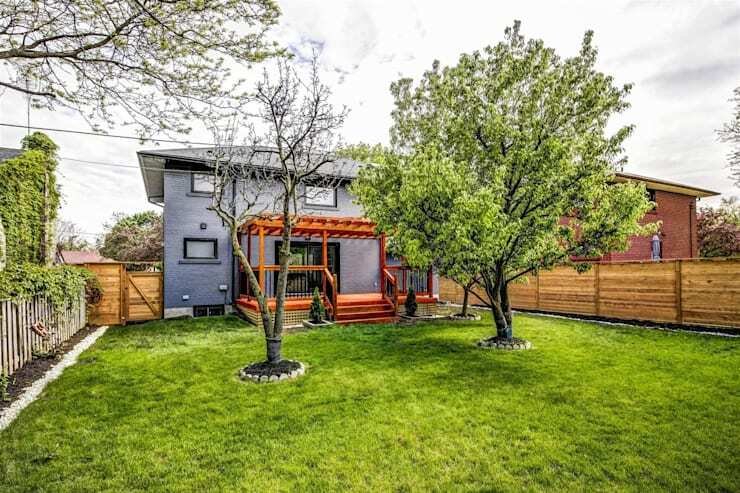 This Toronto house has a green backyard, with lush grass. The designers let the trees be where they were and just created a small border around to add beauty to the backyard. The sides are fenced with wooden fencing from all sides, making it a safe playing area for the kids as well. Love gardens? Here are some beautiful and affordable garden ideas that you can use. 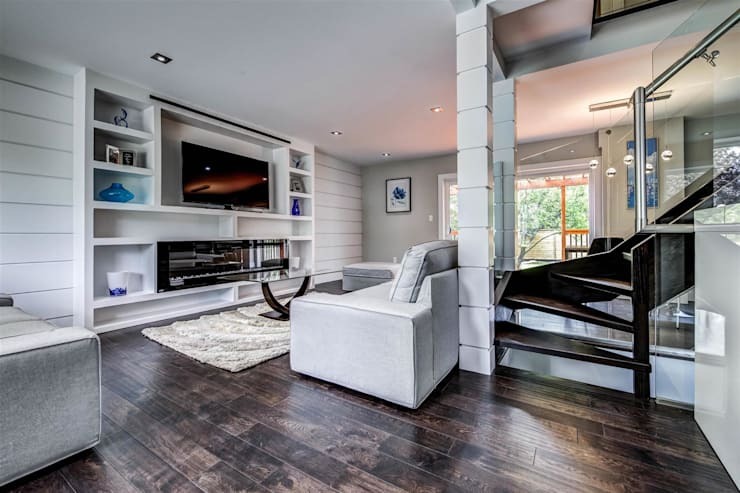 Hope you liked this modern and simple Toronto home and found the inspiration that you were looking for.